Slim EZ Fold N Go walker helps you through the tightest spaces on the go, and quickly and easily folds for out-of-the way storage when not in use. Contemporary roller walker design features 6”dia. swivel wheels with locking mechanisms that can be set in fixed or swivel positions. Easy-glide feet maneuver over any surface. Included two-pocket organizer offers easy access to your phone, reading materials and other essentials. 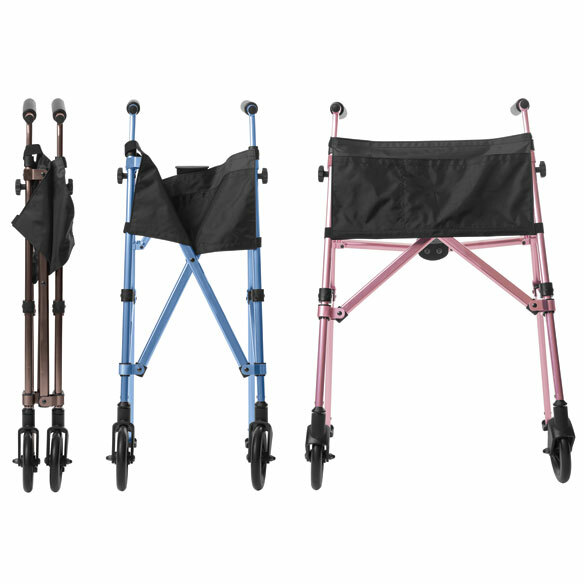 Heavy duty walker is available in 3 colors: black, blue and rose. Lightweight aluminum frame weighs just 7 lbs. 25 1/2”W x 21 1/2”D with 18”W handle when open. 36”H x 5 1/4”W x 8”D when collapsed. Great walker. Easy for me to lift out of my car. I use it to go shopping on my own.I can go into a store without someone having to help me. I am quite satisfied with this product. I recommend it to anyone who has the same walking problem as i have. I feel it to be more sturdy a nd easy to handle than the your other model. Needed a small walker for a vacation tour with a group with limited space. Front wheels wobbled over every grant crack anywhere. Almost caused me to loose my balance till I got use to the wobble. The slower you go the better! Disappointed that the company didn't think this was a problem and had no fix for the narrow wheels! Because of light weight, difficulty managing direction, shoul not be used by persons with tremors, or serious balance issues. Yet., it provides more overall security than a cane if you have multiple pain loci. Check to see if wheels can be better aligned. It is very light and easily stored! We need an easy fold walker to get thru the gate and get into the car. Lightweight and can be folded and put out of the way. I have a friend to whom I give rides occasionally. She has one of these walkers and I like the way it folds, so now that my mother needs a new walker, I want one like my friend's. Appears small and compact but functional. I have one of the ultra light walkers in rose and it only has wheels in the fronti would like to purchace wheels for the back .I cant seem to find them thin enough ? BEST ANSWER: Thank you for your question. We do offer a 5" and 3" walker wheel sets. These wheels are designed to to fit most standard 1" diameter folding walker legs. We hope this information will be of help to you. HELP! I would like to buy wheels to replace the back sliders. In an earlier question, staff said your catalog replacement wheels might fit. Do they fit? I don’t want to buy and find out they don’t work and have to return. Also, can you provide the contact info for the manufacturer? In a staff response, it was suggested to contact makers but no info was offered. Are there any replacement back leg shoe available? BEST ANSWER: Thank you for your question. 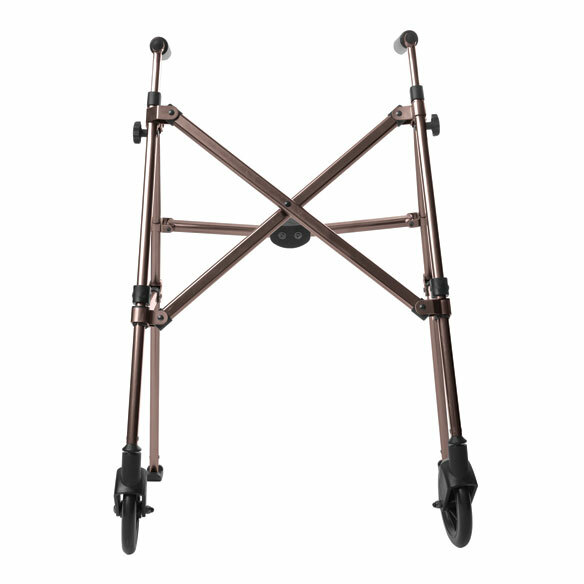 At this time we do not carry replacement parts for the EX Fold N Go Walker. We apologize for any inconvenience. Is the width of this walker smaller than a standard walker? BEST ANSWER: Thank you for your question. We cannot be sure, as there are many types and sizes of walkers out there. The dimensions for this walker are listed in the advertisement.We hope this information will be of help to you. BEST ANSWER: Thank you for your question. Unfortunately this will not fit in an overhead bin. We hope this information will be of help to you. Where can I find replacement sliders? BEST ANSWER: Thank you for your question. We suggest you contact the manufacturer. We hope this information will be of help to you.